A WSJ page-one article today reports on the “non-GMO” label trend, but lets step back a bit: What exactly is a GMO? Put simply, GMOs are crops or animals whose DNA has been altered to add traits deemed desirable by producers, most commonly those that help growth, like resistance to insects. Calgene Inc. started selling the first commercialized GMO product in the U.S. 20 years ago: the Flavr Savr tomato, engineered to delay ripening. The product’s profits didn’t ripen either, and it disappeared, but a spate of other GMO crops quickly arrived from rivals including Monsanto Co., which acquired Calgene in 1997 and is now the biggest seller of GMO products. Today GMOs make up more than 90% of the corn, soybean, cotton, sugar beet and canola grown in the U.S, and the Grocery Manufacturers Association, which represents big food companies, estimates GMOs are in about 80% of packaged foods. Here are a few things worth knowing about GMOs. Are GMOs harmful to health? The U.S. Food and Drug Administration says consuming GMOs is safe. A number of other major health and science groups agree, including the American Medical Association, and the American Association for the Advancement of Science. There have been no human studies on the long-term health impact of consuming GMOs, only animals studies, as is typical in determining the safety of food. Anti-GMO groups like Green America and Center for Food Safety point to published studies that say there are signs of toxic effects in animals that ate genetically modified crops and say more research needs to be done. 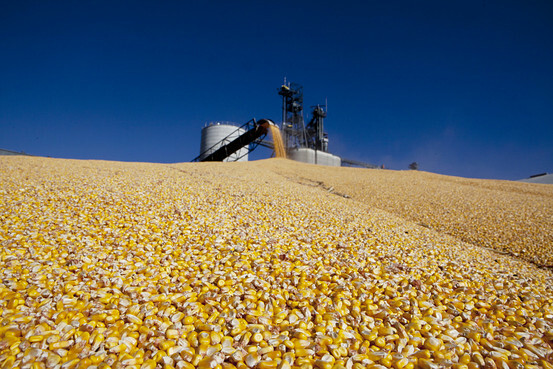 GMO critics also raise concerns about the health effects of the toxin inserted into corn DNA to make it insect-resistant, and about glyphosate, the main herbicide used on GMO crops. GMO proponents contest those studies, and say other research shows that the products are safe. 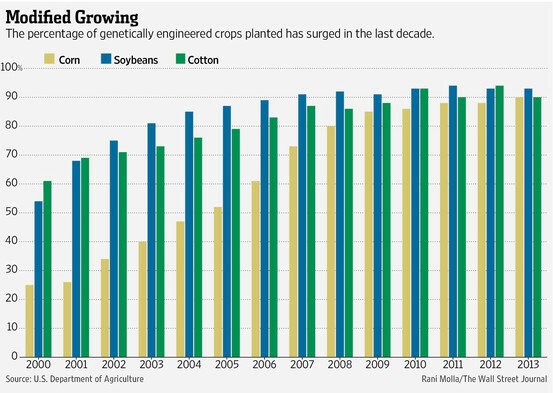 They say that GMOs are simply a technological extension of the plant breeding people have done for centuries. Do GMOs increase pesticide use or hurt the environment? Proponents and critics offer conflicting arguments, and there is no current, authoritative data on the volume of pesticide use in the U.S. Generally, evidence indicates that insecticide use fell after GMO crops were introduced, but that farmers have started increasing their use again in recent years as some pests develop resistance to the genetic traits in those crops. Farmers also have found some weeds developing resistance to glyphosate, prompting them to spray more kinds of herbicides in recent years. 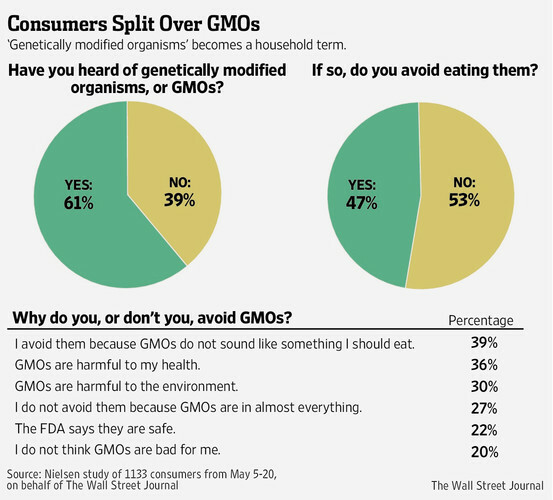 What impact do GMOs have on farmers? Critics of GMOs say that reliance on genetically modified seeds, whose use the seed companies tightly control to protect their intellectual property, leaves farmers economically beholden to big companies like Monsanto. Monsanto says that is a misconception and “disparages the intellect and business acumen of farmers.” It and other GMO proponents say GMOs benefit farmers and consumers by increasing crop yields and suppressing prices. 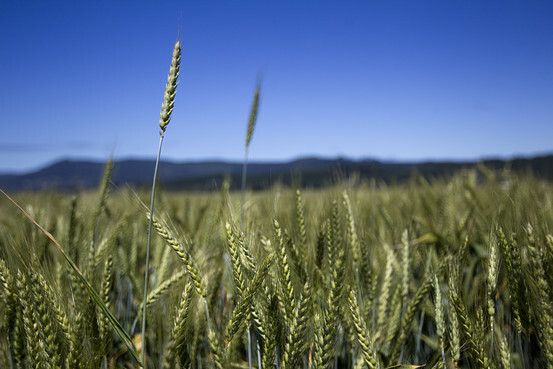 The advocates also argue that genetic engineering technology is essential to feeding the world’s fast-growing population, highlighting traits in development like drought resistance and enhanced nutrition. Critics say those uses of GMO technology are unproven. What do other countries say about GMOs and GMO labeling? More than 60 countries, including European Union member states, require labeling or stricter regulations of GMOs. The European Union, and additional countries that require labeling including Australia, Japan and Brazil, still deem many GMOs safe for consumption. Only a small handful of countries, including Benin, Zambia and Serbia, ban GMOs completely.